February 2nd or 3rd. Workshop duration is 2 hours. This is an amazing opportunity to get help and guidance from the experts. G3 Tutoring students have not only increased their score on the SAT/ACT considerably but also G3´s hands-on-approach goes beyond just academic preparation. G3 builds confidence that in turn boosts a student's self-esteem - very important going into college. 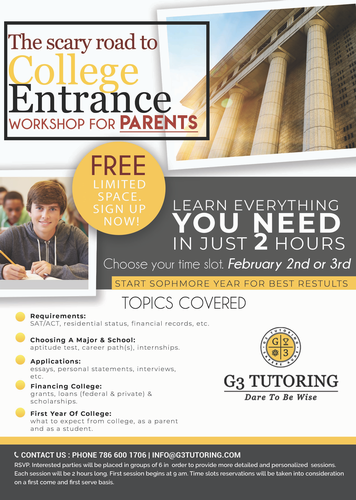 This weekend is the workshop for parents but bringing your college bound son/daughter will help in the entire process. Don’t miss this amazing free gift G3 is giving. Interested parties will be placed in groups of 6 in order to provide more detailed and personalized sessions. Each session will be 2 hours long; The first session begins at 9 a.m. Reservations will be taken into consideration on a first-come and first-serve basis.